This week, the Pono guest teachers represented the diverse interests of our children! 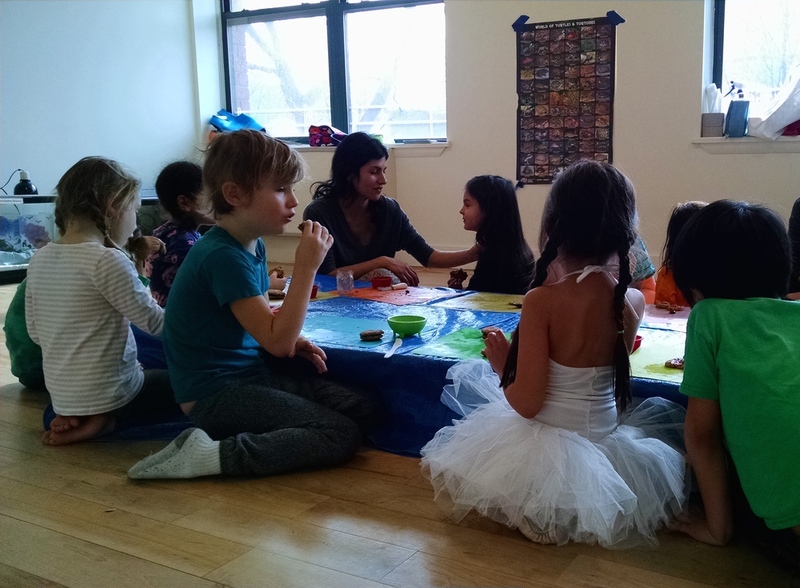 Monday, guest teacher Julia visited to teach the children ballet. Julia introduced everyone to a whole new way of looking at their feet, and they got the chance to practice first through fifth positions with coordinating arms. The children even had an inspired idea to invent sixth and seventh positions right then and there at Pono! The dancers cleverly used the windowsill for their barre work and then learned how to spot when turning to not get dizzy. Finally, the kids put everything together and danced across the floor to “Sleeping Beauty.” By the time the class ended, it was hard to let Julia go! Later that day, Paul brought back his Yo-Dan-Nastics to Pono. (Keoni Movement Arts is non-competitive gymnastics presented from a yoga and dance perspective). The class warmed up by hopping across the floor like frogs and kangaroos (always ending each turn with a sleeping version of the animal), slithering like snakes and crawling like crabs. Then came the obstacle course where the kids jumped over a big noodle, breathed in mountain pose, did a supported handstand walking their feet up the wall, all while counting to a number between 1–20 (! ), followed by navigating a scooter board across the floor in different body positions and finishing with child’s pose. All involved had a blast with the soundtrack of piano versions of “Grease,” “Beauty and the Beast” (thank you, Sulaf) and “Cabaret” to keep them invigorated. Tuesday, Professor Gailani from CUNY sat with the older kids and educated them about car production—how cars are made, how many are manufactured, and where and why things are done collectively. He also touched on the manufacturing of the space shuttles and gave everyone NASA stickers and bookmarks with neat facts about space travel. That afternoon, Poppy gathered all the Pono friends to finish a project they had started earlier making beautiful papier-mâché bowls. Now it was time to paint them, and Poppy showed the children pictures of decorative bowls from different time periods and cultures for inspiration. Gold seemed to be a favorite color when the kids finally chose their palates! Elsewhere on the tarp, the kids embarked on the next art creation—mosaic tiles! Using terracotta clay, they pressed, blotted and shaped big clay squares with rolling pins and then cut them into tiny tiles ready for the kiln! The classes led by the Pono staff and students were characteristically full of excitement and wonder, too. Time to take the new stovetop out for a spin (Thank you, Victor!) with cooking and math led by Mufeeda and Maysaa. This tactile and thoughtful activity yielded giant gluten-free strawberry pancakes made by learning how to halve the recipe. What a great way to understand fractions! Kate gave the littlest Pono friends a chance to observe and pet the Pono pets while out of their cages! The kids got to watch them exercise and move around their environment in new ways. Carmen led a lively music class where Bodi even serenaded the gerbils. This week, Dr. A worked with the littlest Pono friends on sorting plants and animals into different classifications. She then zeroed in on caterpillars and their food and living habits. Dr. A led the older children step-by-step through an engrossing DNA experiment. They swished salt water, spit it into plastic cups, and added blue detergent. The result? The children could see their own unique DNA inside a plastic cup! On Thursday, Takota (and his mom, Jena) taught the kids a zippy way to make almond butter sandwich cookies with berry or apple jam. The group rolled and patted down balls of gluten-free dough and then wrote their initial on each of their cookies. The whole upstairs smelled like coconut oil heaven. While the cookies were baking Zoë, armed with her white tutu and the soulful Kate Bush, led the kids in a dance class. Her joyful, gentle spirit held her peers while they skipped, spun and danced serpentine around the room. At one point, the kids resembled a beautiful lyrical dragon in a Chinese New Year parade. As always there was illuminating literacy with Julietta, rosy-cheeked outdoor play, pop-up art projects and lots of reading and exploring the Pono bookshelf throughout the week. This week’s fieldtrip featured Brooklyn’s Industry City in Sunset Park. The 3 to the N to 36th street brought us first to Alexandra Ferguson, a pillow factory where the pillows “Say What Everyone Else Is Thinking.” Our hostess, Alexandra Ferguson, herself, graciously welcomed Pono into her light-filled loft where the kids learned about designing and manufacturing pillows made from 100% post-consumer recycled plastic bottles. The kids met her staff of seamstresses and saw how to cut out felt, sew cursive letters with a sewing machine, “make the pillows 3-D” and even affix a tag to each finished product. Afterwards, Alexandra escorted everyone one block over to her friend, Erin Ozer’s confetti factory called KNOT&BOW. The kids made confetti by combining several different types of paper in a big bin. After the confetti was mixed, pretty much the best thing ever happened – Erin let them throw it up in the air again and again all over themselves (and the offices!) to their heart’s content. Erin gave each child a little packet of stickers on their way out. The fieldtrip finished in Industry City’s gorgeous lunchroom, a place filled with long wooden tables, high ceilings and cool modern industry murals on the walls. The children (and big Pono friends!) won’t forget this day anytime soon. "This week Pono's musical, "When Times Get Tough," welcomed Zoë Deshmukh as its newest actor-singer, and Towa Mikami as co-director. They took to their new roles like ducks to water, and the energy was palpable! Aure and Sulaf, now old hands, lent their support and rehearsals are up and running." Have a wonderful, restful winter break, everyone!